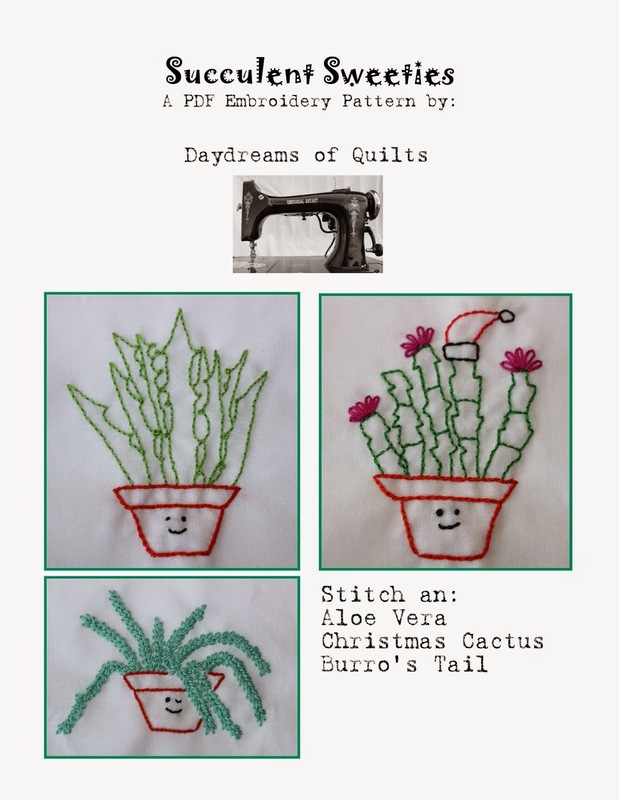 I am happy to bring you my "Succulent Sweeties" embroidery pattern. I have created an embroidery stitch tutorial library on my blog if you are new to embroidery and all my patterns have a link to get there. There is also a button in my sidebar that will take your there. I love succulents. They are pretty easy to grow and take care of and they look really cool. They are also "en vogue" right now in the sewing world. Plants sometimes seem to have a personality of their own. Even if only imagined by the gardener or plant keeper. My sister and I sometimes name our plants based on someone they look like. I had a Burro's Tail that I named "Lenny" because it looked like Lenny Kravitz's dred locks. My sister has a fern named "Sideshow" that looks like "Sideshow Bob" from "The Simpson's". Maybe I'll make a "Sideshow" pattern next! Sneak Peek! Coming soon to Daydreams of Quilts: My "Kawaii Cacti" Pin Cushion Pattern! I plan to release it next week. Kawaii Cacti Pin Cushions by Daydreams of Quilts. Sew Mama Sew giveaway day is coming next week too so stay tuned for giveaway prizes!